Making a Splash at the New Pad! One of the selling features of our new home was the yard. It doesn’t boast acreage or anything, but it has ample space for the quads to jaunt around, and eventually for us to add a small playground. Although the garden needs a little a lot of TLC, the previous owner had the yard fully landscaped with many ornamental plants and trees. Every morning after breakfast and in the evening before bed, we enjoy a little time outdoors. 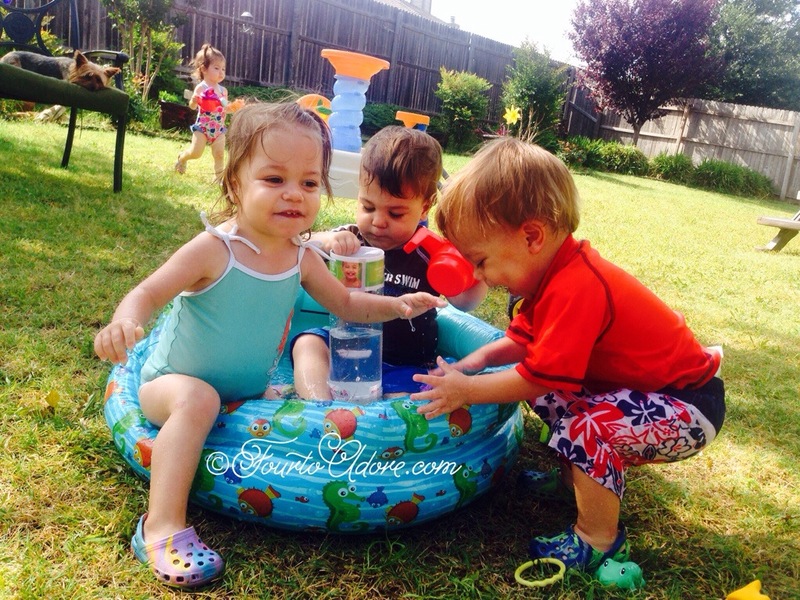 On most mornings, we have a little splash party using the water table followed by a bubble bath. In the evenings the quads dart around as we weed the once neglected flower beds. A few mornings ago, I captured some of our morning shenanigans. 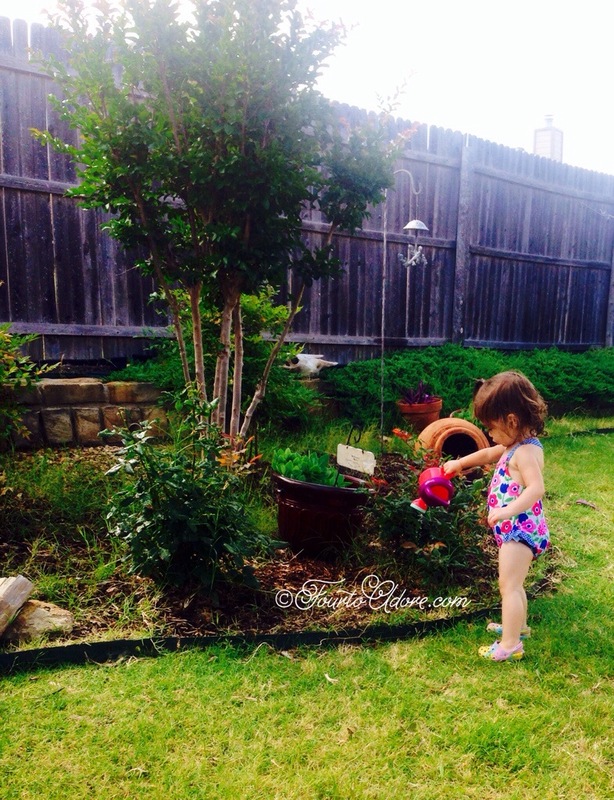 Rylin took it upon herself to water the rose bushes with her pink watering can. She refilled it multiple times to make sure the roses got a nice drink. 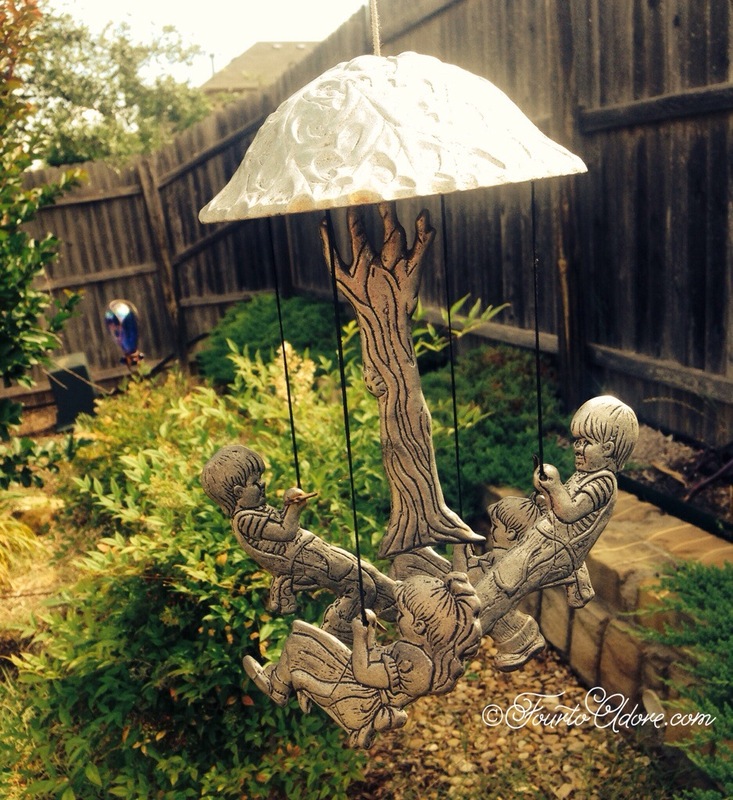 We received this pewter wind chime as a gift from a family friend. 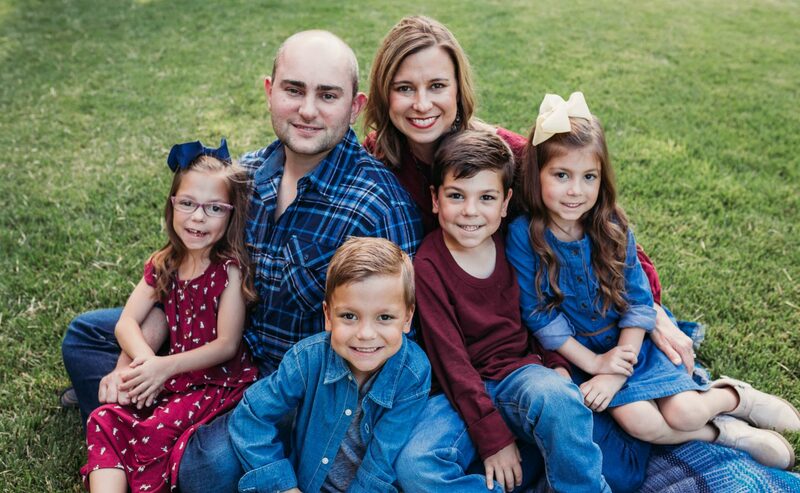 It was in her family for years because there were two girls and two boys in the family, just like ours. It made the perfect addition to our new yardscape. The quads are fascinated by the mellow tinkling of the chime dancing in the breeze. 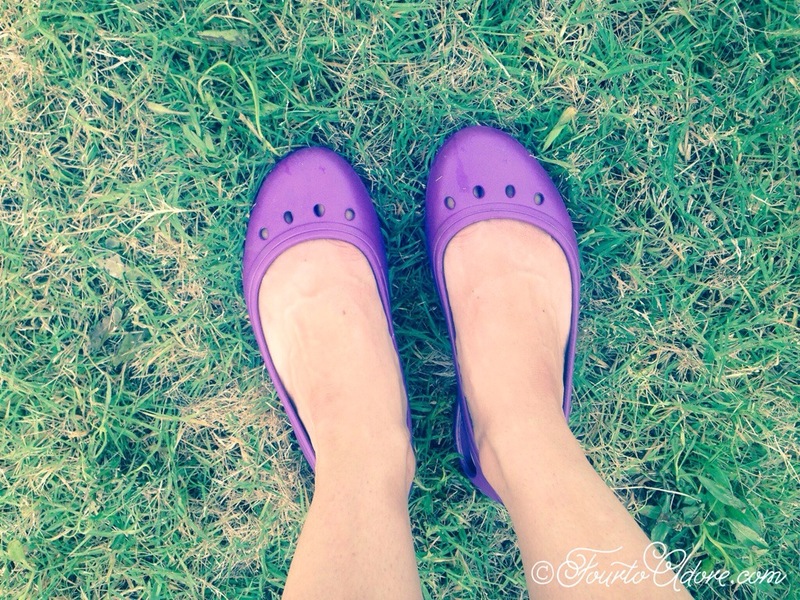 A few months ago, I purchased faux crocs for the quads to wear in the yard. They’ve proven themselves as yard must haves for us. They protect tender baby feet and rinse off easily with the garden hose. I stumbled upon a pair on clearance at Marshall’s in my size and snagged them. While I’m not hip to the fashion statement they make, I am in L-O-V-E with these shoes. Oh how I’ve been missing out on the goodness of Crocs for the yard. They are ohhhh sooooooo comfortable and yard work friendly. The fact that they are violet and ballet slipper style helps my inner fashionista to appreciate them. We have an assortment of inflatable baby pools from the quad’s first birthday party last summer. However, I didn’t have the patience to inflate one of the larger ones so settled for the tiniest pool ever created. It served as a “Go Fishing” pond for the party, and was never really intended for wading. 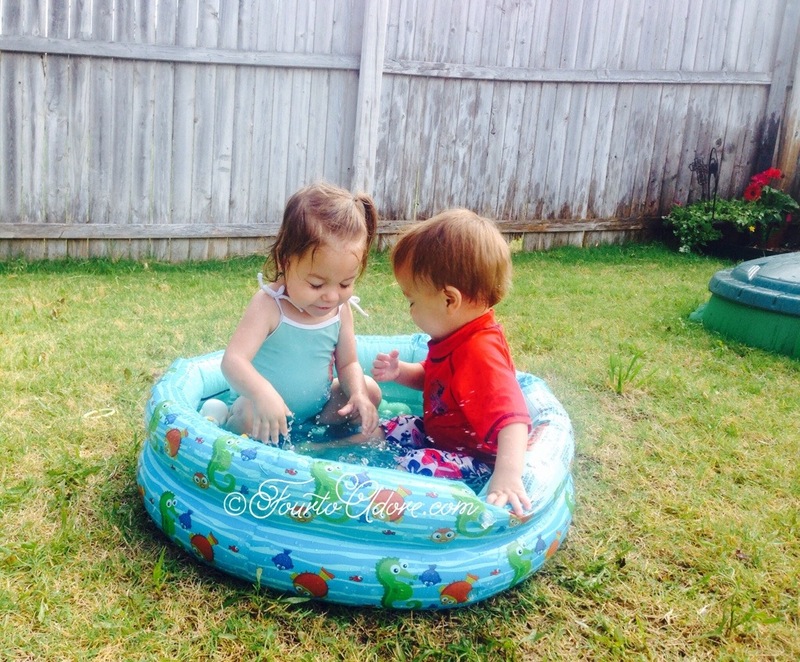 It began as extra splash space alongside our water table until someone took a dip….then another….and another….and then all four. 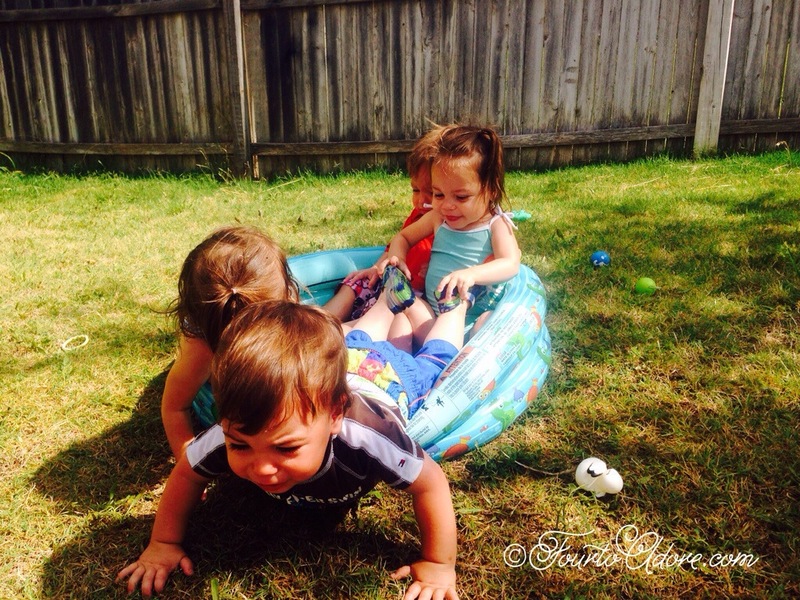 We enjoyed nearly a full hour of splishing and splashing before the dog pile resulted in cranky babies. 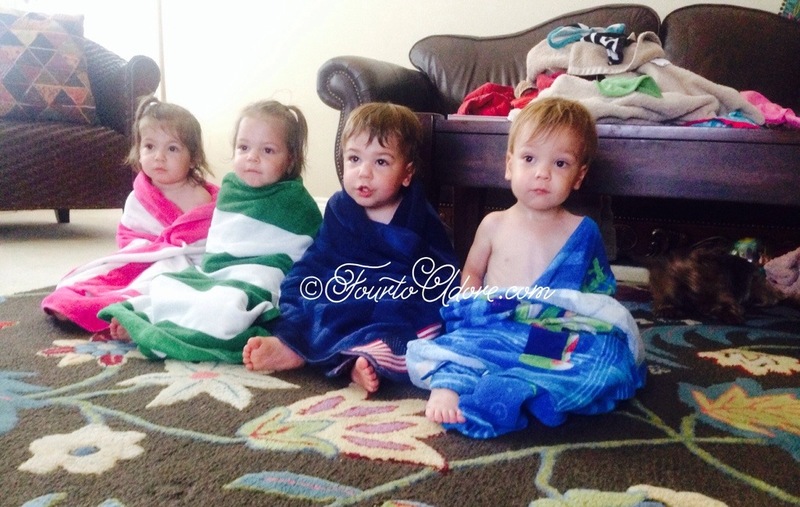 When the party ended, I stripped all four babies down in the yard, hung the soppy clothes on the swing set and wrapped each one in a dry towel. I took a tip from fellow quad mama, Amber, and lined each baby up as they waited for a diaper and outfit. Much to my surprise, they waited perfectly still for their turn! Of course, the episode of Mickey Mouse Clubhouse helped my efforts. Once the babies are snuggled into their beds for the night, we often enjoy a glass of vino or iced tea from our front porch. 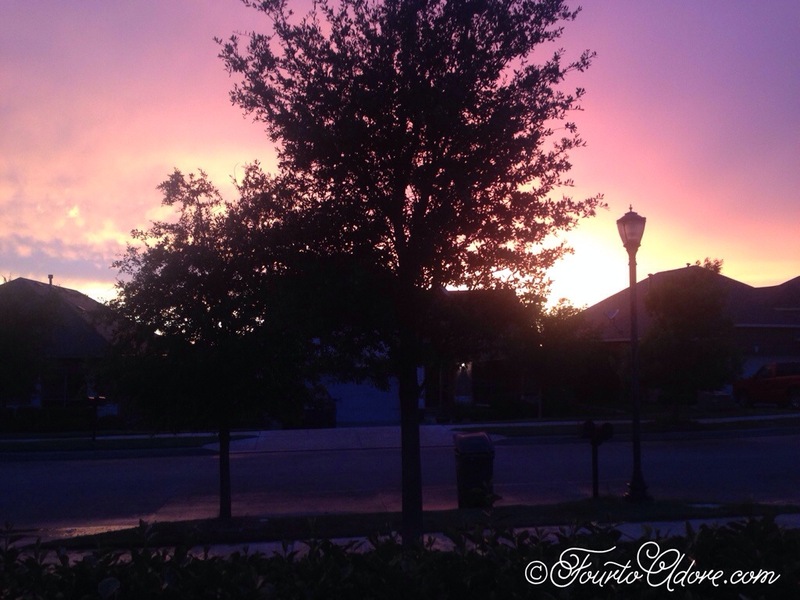 The sunset is gorgeous! Have you ever owned a pair of Crocs? If not, would you consider it? Love me some crocs. The babies are SO cute and what a wonderful gift of the chimes.Seems you have at least one gardener. Such a peaceful environment. I knew I’d find more croc fans :). The yard really is peaceful and entertains the crew for large amounts of time. Love it! Looks like a beautiful yard. What summer fun! I don’t see a lot of crocs over here and I want to guess they’ll be ridiculously overpriced! (As are Converse and Dickies lol). I’ll have to get some when I go back to the States! I bet they’d be overpriced too! And I bet there aren’t any imposter versions either. Our youngest is three, and she wears them around the house/backyard/pool in the summer. However, my budget is happy with the faux Crocs which can be found at Wal-Mart/Target. Lots of different designs, and the kids as well as their friends do not seem to worry about the difference. They just think they have easy to slip on/off shoes with cute colors. For being what I considered to be frumpy shoes, they are so practical! They are also way cuter in kid’s sizes than adult ones. I’m glad to find myself in good company as a fan of crocs, faux or authentic!